United States Route 29 is a significant roadway through Charlottesville and Albemarle County. Plans to build a Western Bypass were debated for many years before the project was derailed by the location of the final resting place of Jesse Sammons. Funding set aside for that project was transferred to a series of projects known as the Route 29 Solutions. North of Charlottesville, U.S. 29 is signed Seminole Trail. 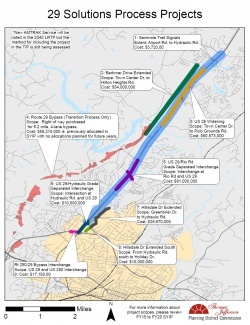 "Albemarle County and Thomas Jefferson Planning District Commission staff are working with consultants to produce more definitive cost estimates for the five grade separated interchanges proposed along the US 29 North Corridor. In October 2006, the Albemarle County Board of Supervisors considered a request from the University of Virginia Athletics Department to rename the road from Seminole Trail to Cavalier Way, after the Virginia mascot. The renaming of the road became a front page story in The Daily Progress and the subject of an editorial in the paper. The matter was quickly dropped by the Board of Supervisors and no action was taken. ↑ Web. VDOT sets aggressive deadlines for Route 29 projects, Sean Tubbs, Charlottesville Tomorrow, July 25, 2014, retrieved July 27, 2014. ↑ Web. National Register of Historic Places, Jennifer Hallock and Gardiner Hallock on behalf of the Piedmont Environmental Council, Application, Albemarle County, March 2, 2005, retrieved July 17, 2018. ↑ Web. Completion of State Highway , South of the City, Staff Reports, Daily Progress Digitized Microfilm, Lindsay family, printdate=January 22, 1925, retrieved May 16, 2016 from University of Virginia Library. ↑ "Seminole Trail becomes Cavalier Way?" Wheeler, Brian A. Weblog post. Charlottesville Tomorrow News Center. N.p., 4 Oct. 2006. Web. 29 June 2009. .
↑ Web. Head-scratching over rash of crashes on U.S. 29 in southern Albemarle, Bryan McKenzie, Daily Progress, World Media Enterprises, January 9, 2016, retrieved December 27, 2016. An article on Wikipedia has information about U.S. Route 29 in areas beyond Albemarle County's borders. This page was last edited on 9 September 2018, at 23:46.